Earlier this summer, SOMA launched the Wolverine and billed it as a MonsterCross adventure bike and a 29’er with drop bars. The Gate’s Carbon Belt Drive compatible frame boasts clearance for 45mm tires with fenders, sliding drop-outs, a full suite of braze-on’s, Tange Prestige tube set, understated retro graphics, and it’s all dressed up in the color of the year. I was keen to bring a couple framesets into the shop, even build one up for myself, when Justin, from the local club, Point83, gave me the green light to come up with his custom build. 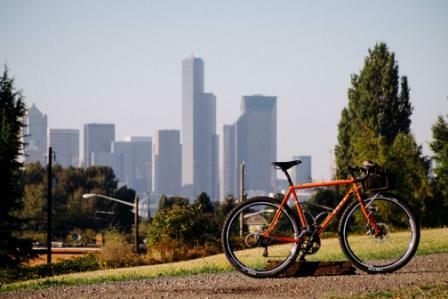 His bike was recently stolen while in Portland. He had just completed doing medical support for the STP ride, and now he needed something sweet. His requests were easy- SRAM Rival, green Chris King, Thomson cockpit, and white cable housing. 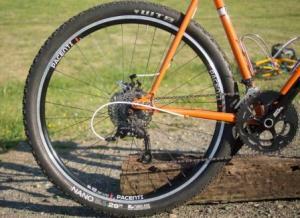 SRAM Rival, Pacenti SL23’s laced to White Industries CLD rear with DT Swiss Revolutions. WTB Nano 2.1 meaty’s maxed out tire clearance. Made to go around by a Wipperman Black edition chain. The SRAM Rival components set up super easy and worked intuitively with the TRP Spyre brakes (more on that in a bit). Mounting the Nano 2.1’s to the SL23’s was a bit of a challenge. Soapy water, a compressor, a few goes at it, and an extra measure of patience sealed the deal. This system is tubeless ready, and I would encourage trying it out. Once properly seated, the tires filled out nicely. WTB Nano 2.1’s maxed out the clearance. The extra volume begged to pointed towards the woods, into singletrack, and through busted up alleys. 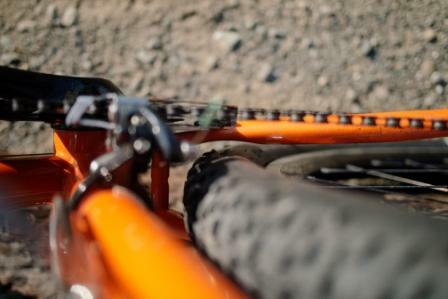 The IRD/Tange-designed sliding drop-outs further enabled going with the big 2.1″ tires, but fenders would be a no go. 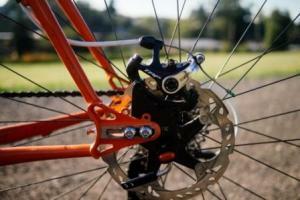 The drop-out’s are designed so that sliding the wheel does not interfere with the disc brake set-up. They simply move together. TRP Spyres with Shimano 180mm centerlock rotor. 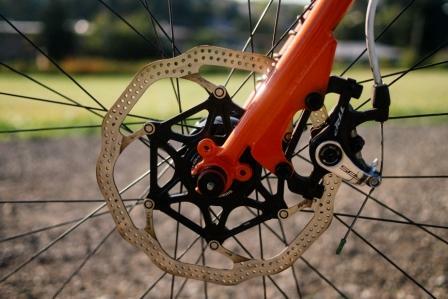 The TRP Spyre’s dual piston caliper brake has known issues clearing the front wheel spokes with 160mm rotors. With a 180mm rotor, clearance was restored. Pictured here, the fork blade caliper mount isn’t the most elegant solution, but it does provide ample contact with the fork blade. This is one fully featured drop out. The rear drop out hosts a myriad of adjustability and compatibility in a handsome package. Also, can I say how exactly RAD the Paul Components quick-release skewers are? It’s just a quick-release skewer, I get it, but the action is ultra positive thanks to the ovalized cam and the lever feel is good, like clapping your hands. 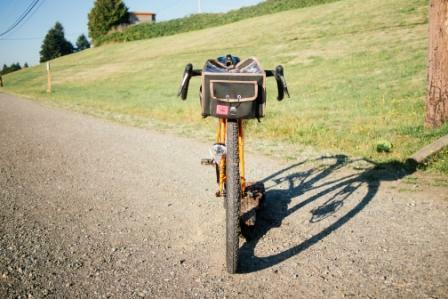 The initial set-up of the bike was aimed at quick, spirited, 1-2 day summer adventures. I cannot say enough good things about the Salsa Cowbell bars. With their compact transition to the hoods, the slight flare of the drops, I find many usable hand positions, especially when the route tends towards loose gravel. They have become something of a mainstay in the cyclocross arena. The wheels are a highlight of the build- 24mm wide Pacenti SL23 rims laced up with DT Swiss Revolution spokes- inspiring confidence with the quick and positive engagement of the new White Industries CLD centerlock rear hub (their lightest weight hub yet!). To complete the build, we opted for a dyno hub light system- SON28 and the new Luxos U, with it’s USB recharging capabilities- infinite light and USB energy on the go. Built up, the Wolverine inspires confidence, begs to be ridden, and with the gentle slope of the top-tube it preserves an aesthetic that I find very important. I wanted to ride this bike all over the Cascades. But How Does the WOLVERINE Handle? the Wolverine is at home on singletrack as well as asphalt. In fact, I can’t think of any type of road I wouldn’t want to take it out on. 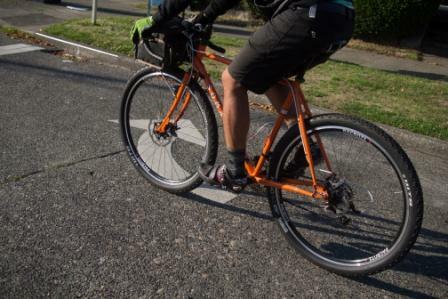 The one thing I did not have an opportunity to do was to try out a pair of lightweight, all-road mid-sized tires (35-45). I have a strong feeling that paired with a set of Compass Bicycles 38c Barlow Pass tires, some on-road quickness would be awakened. I did notice a couple of inconsistencies while building the bike up. Neither of the rear drive-side eyelets were threaded. This oversight could have been a major spoiler. As per SOMA’s request, it’s important to have a qualified bicycle mechanic thoroughly inspect the frame after shipping and to prep it (chase and face the BB, face the head tube). Tange Prestige steel feel is still good. The frame encourages a wide, wide range of applications. 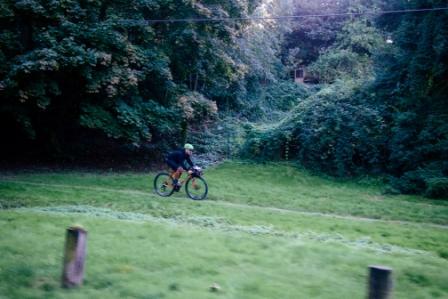 A drop bar 29’er just feels fun. These wheels are SO boss. Need to build rider confidence in the fork during technical descents. Why not a third water bottle cage mount? 2.1″ tires might not get you across town very fast, but it’ll be fun. Is this the new breed of All-Road bikes? The word is out that skinny tires won’t get you very far in the woods, or through and across the mountains. Spectacularily appointed, the Wolverine is like a custom frame/fork, at 1/4 the price. The geometry comes up a bit slack for trying to win at the races, but it’ll be your friend during those hour long descents into pure adventure. There are only a few offerings in the “MonsterCross” catagory, but gravel grinders and bike-packers alike would respond well to SOMA’s newest family oddball. In the next couple of years, I expect this segment of the market to expand dramatically. SOMA has established the bar with a tremendously versatile steel bike. And what’s so odd about it? Well, just that there’s not much out there like it. 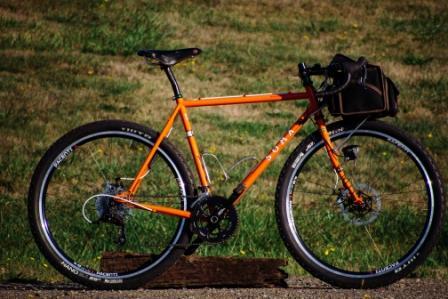 SOMA Wolverine – msrp $599 frame/fork, $3599 as pictured.